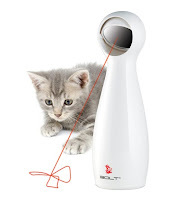 I am not much on cat toys, since I no longer own any cats,or rather since no cats own me at the moment-- but the Frolicat Bolt is rather cool and I must say that if I did have a cat, I would buy it since I think it is a very nifty idea. So cat owners and cat lovers, as the annual holiday shopping frenzy is about to kick off in earnest, I offer you the Frolicat Bolt as a perfect Christmas gift for all the pampered and bored cats on your list who long to chase mice, but live in houses and apartments Let them chase lasers instead. You can just flick a switch and the bolt will send a laser light hither and yon for kitty's delictation for about 15 minutes-- soooo much easier than a ball of yarn eh? And the best idea for cats since catnip IMHO. Have a look at the video below and then order the thing, from Amazon-- What could be easier? That's what I'm going to do. Wish this had been around when I had a cat! Would've kept him occupied for *hours* and saved me pulling the sofa away from the wall at least once a day to retrieve his favorite balls. Cool!